How cold is too cold for me to have my wedding outside? Temperature is tricky, because you will never get it right for everyone, even indoors. And as it turns out, you don’t have control over the weather. (You can plan your wedding for a day that should be a balmy 70°F and be surprised by 100°F temperatures. Which, yes, is too hot.) But in general, 80°F will usually feel hot, 60°F will typically feel cold. But not always. Where you are in the country matters. If you are having a wedding in Miami with mostly guests from Miami, your temperature range is very different than a wedding in Maine with mostly guests from Maine. And trying to have a fall outdoor wedding in Maine with mostly guests from Miami will pose its own challenges. Sun versus shade, dry versus humid, time of day, length of ceremony—all of these factors make a difference. But the risk of the temperature not being perfect for everyone doesn’t mean only people in Southern California where it is always 72°F and sunny, never humid, and smells sweetly of oranges get to have outdoor weddings. I believe firmly that you can have many different things at your wedding, but not necessarily all the things. Do you want five readings, a procession of fourteen small girls carrying streamers, and zero pressure to start things right on time? That sounds so lovely. Please don’t make your guests sit out in the sun in 90+°F weather while you do all of that. Is a religious vibe really important, and having all your families light a unity candle, and long personal vows? Know that if you start your ceremony thirty minutes late, and then it’s kinda long, it will have gotten dark, and that crisp fall day is all of a sudden plain cold. Have a backup plan you are reasonably comfortable deploying. You can’t make a good decision on the weather when your alternative is cramming all of your guests into a windowless basement and having half of them stand. There are places where you really truly don’t need to worry about this, but they are few and far between. They may actually all be in California, now that I think about it. Guests also have a role to play here. Be an adult. Do you know the wedding is outside? Are you worried you will be cold? Wear. A. Coat. Hot? Floppy sun hat, lightweight clothes, consider a frozen bottle of water in your purse. Don’t forget you can say no: it’s nice that your cousin’s wedding vision involves actual snow, but that doesn’t mean your Saturday afternoon vision needs to include snow pants and an igloo. When the wedding turns out to be in full sun, in 90°F weather, and it’s starting late, you can leave. Go inside, sit in your car with the A/C on, ask someone at the venue for ice water, and tell them to text you before the wedding starts. Your wedding isn’t an imposition. Frostbite and heatstroke are. DO YOU FEEL LIKE EVERYWHERE YOU TURN, MORE PEOPLE ARE GETTING MARRIED? LIKE ATTENDING WEDDINGS HAS SOMEHOW BECOME YOUR HOBBY? 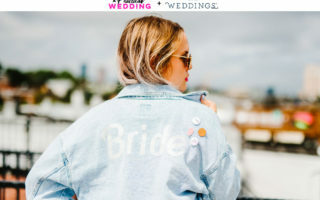 IS “EXPENSIVE CRAP FOR OTHER PEOPLE’S WEDDINGS” A BIGGER BUDGET CATEGORY THAN “MANICURES, BOOKS, AND CHEESE”? EMAIL ME: AMYMARCH [AT] APRActicalwedding [dot] com. 2How Do I Make Our First Anniversary Party In A Chateau As Special As Our Wedding?